• Questionable Tempo Tactic: NCAA Rules Committee takes first step to prevent pitching coaches from dictating tempo by proposing experimental 20-second clock with runners on base. 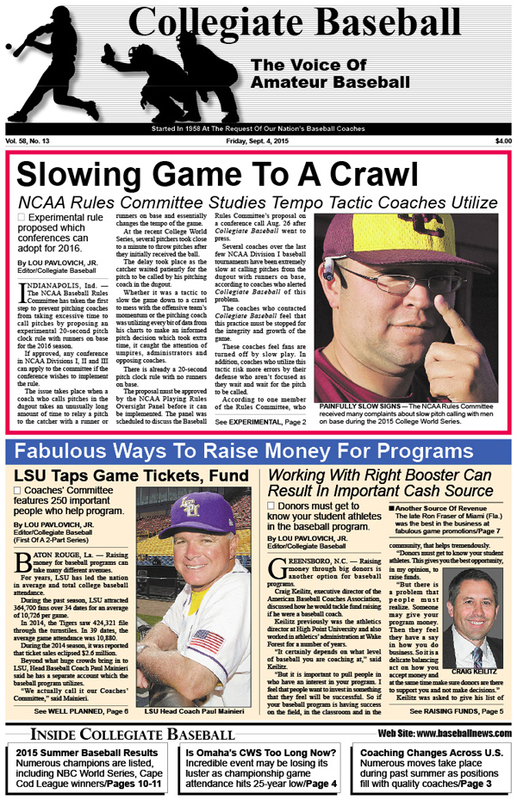 • Fabulous Ways To Raise Money For Baseball Programs: LSU’s Paul Mainieri explains how his Coaches’ Committee, 250 strong, helps his program thrive. • Boosters Can Help Tremendously: ABCA’s Craig Keilitz explains how to handle fund raising from an administrator’s point of view..
• 2015 Summer Baseball Results: Numerous college champions are crowned, including NBC World Series winner, Cape Cod League champion. • Great Promotions Can Draw Big Crowds: Another great source of revenue are innovative promotions which Ron Fraser made famous. • USA Baseball Team Results: Collegiate Baseball looks at every team that USA Baseball fielded this summer and how they fared. • Numerous Coaching Changes Take Place: CB takes a look at many college jobs that were filled across the USA in regard to head coaches, assistants. • Is College World Series Too Long? : Incredible event lasts nearly two weeks as championship game suffers lowest turnout in past 25 years. • $10 Million Facility Planned: Vanderbilt approves project to improve enhanced space in Memorial Gym for instruction, team building, coaching and settings that can foster interactions with returning pro players. • 2016 High School Rule Changes: Collegiate Baseball goes over all of the important rules for next season. • Ruleball With Rich Marazzi: Positives happen when runner creates his own baseline. • Charlie Greene Column: Defending the bunt is a crucial fundamental that must be mastered. • At Death’s Door: Brian Cain presents the moving story of Bryan Kervin and how his knowledge of the mind game helped him grow as an athlete and person who nearly died. • Building A Pitching Staff: Duke Dickerson explains different models that can catapult a team from being average to great. • Inaugural Tony Gwynn Classic: Special event in honor of this Hall of Famer scheduled for February of 2016 with 6 quality ball clubs. • Teaching Professional Of The Year: Chicago’s Mark Sheehan has done a remarkable job helping pitchers grow to new levels thanks to his passion for learning. • Special Trip To Columbia: Tim Fanning of Glenwood School (AL) organizes a unique trip to Latin America that introduces baseball to children among other goals. To purchase the Sept. 4, 2015 edition of Collegiate Baseball, CLICK HERE.